Believe it or not, in addition to farming and blogging and the occasional waitressing shift, three to four days a week I am a working girl. An in-the-city, in-an-office (at least it’s a beautiful non-profit office filled with amazingly beautiful people) working girl. And busy working girls sometimes need a quick go-to breakfast. 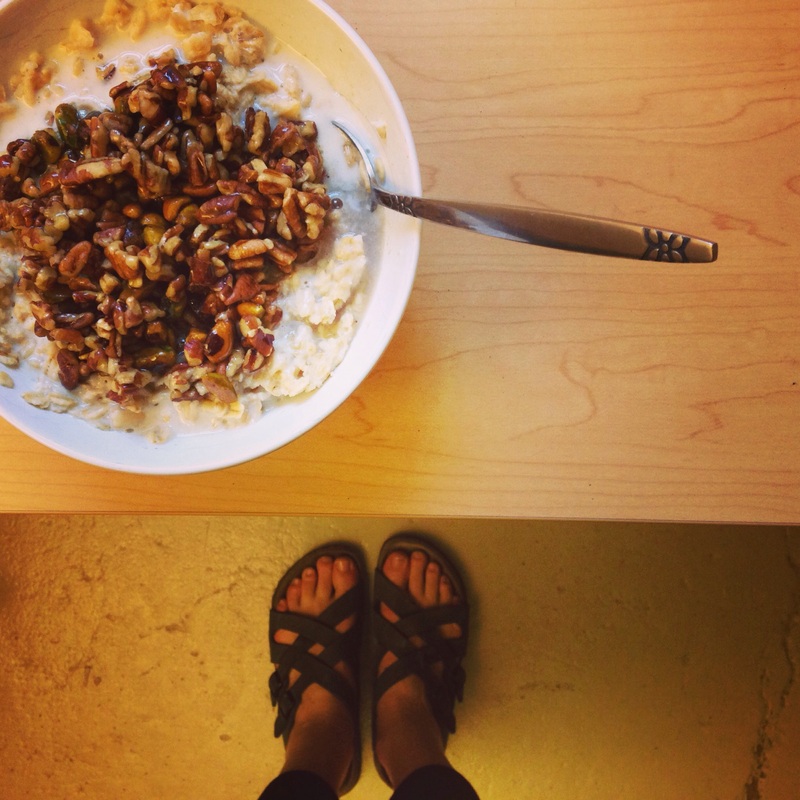 This oatmeal is perfect for making and taking and heating up at work! (If you are lucky enough to have a microwave at work). Don’t we all need a breakfast like that?! You could even make it the night before and stash it in your fridge. 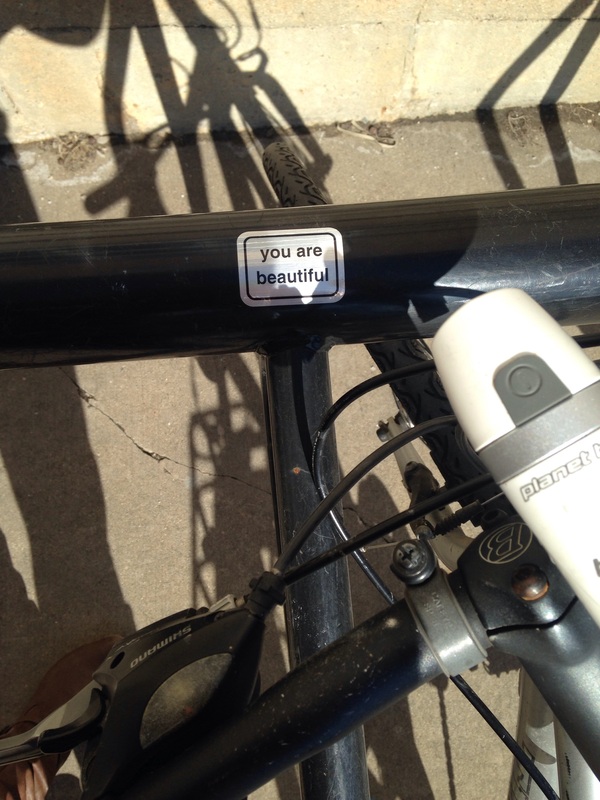 It will even work if you are a bike commuter. Mason jars are my go-to no-spill transporter of food things (especially liquidy food things) when I’m biking around town. 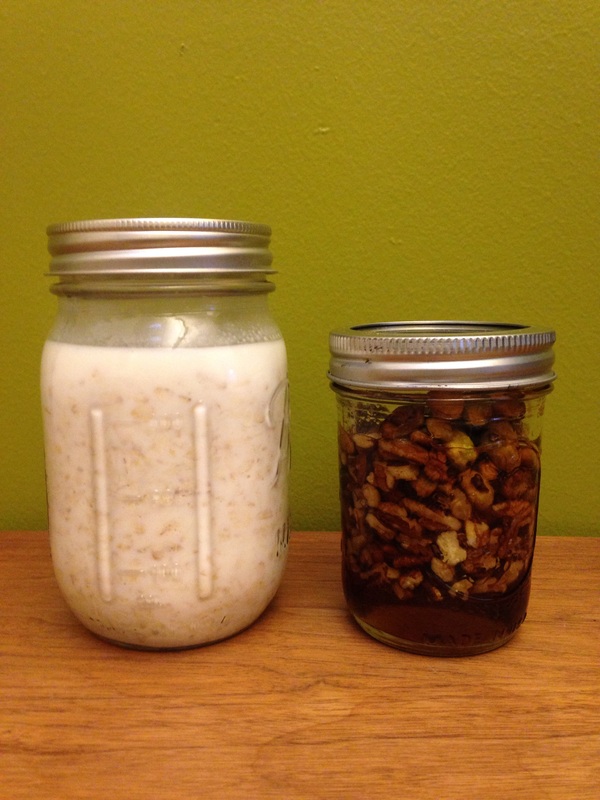 Buy exactly one pint-sized mason jar and one half-pint-sized mason jar and you are set for oatmeal. Every day of the week! This oatmeal is especially spectacular for when wanting to take Monty’s leftover Meatless Monday vegetarian enchiladas for lunch and desperately needing something light in the morning to balance it out. I could go on and on. I love a good bowl of oatmeal. P.S. On a completely unrelated note, I met a fellow lady blogger this weekend. She got a permanent writing gig out of her blog at the Milwaukee Journal Sentinel. And she’s a total superstar. And by some strange stroke of fate, she lives less than two miles away!!!! Combine oats and milk in a pint-sized mason jar. Add nuts to a second half-pint-sized mason jar. If not using any salted nuts, I advise you to add a pinch or two of salt to this mix so it’s not too sweet. Add maple syrup to jar until it covers the nuts completely. (This is not an exact science; more is best though because you won’t have to use it all if you have too much but will be sad at work if your oatmeal lacks syrup). Screw on lids, pack up jars and head off to work. Microwave oatmeal either in mason jar (or dump into bowl) for 1 minute on high power. Stir. Microwave for 1 minute longer. Stir. Check temperature (you might need to microwave 1 minute more depending on the strength of your microwave). Add nuts to oatmeal, I use a fork so that I don’t get too much syrup and can dump more on as needed.